Easter Sunday is just around the corner! I've been busy scouting the 'Burg for some fun Easter treats...and I'm not just talkin' Reeses Peanut Butter Eggs, people! Natalie goes to preschool two days a week. This alone elevates her teachers to sainthood in my book, as those two days have restored some serenity to my life, and it gives me some extra girl time with Michaela Byrd. I knew I wanted to do something special for Miss A and Ms. M, but I also knew I couldn't break the bank. Miss A's jar couldn't have any chocolate eggs because her son is allergic to peanut products. Gasp! If I couldn't keep chocolate in my house, I think I'd have to find a magic pill for them to take or something. Life without chocolate is just not really living. Finally, I added two little personalized cards to the top, talking about what "egg-cellent" teachers they are. Please don't laugh at my "eggs" (I use the term loosely). It was very late, my eyes were starting to cross, and I didn't feel like being crafty at the time. I know there are tons of ways to fix this project up...I just wasn't feeling the love at 12 am. You would have thought we'd given Miss A and Ms. M the moon on Wednesday morning when Natalie passed them out with hugs. I think it was truly just the thought that counted. Plus, they probably already have 5678 ceramic apples that say "#1 Teacher." These would also be fun for Sunday School teachers this weekend. Got this little nest with my Michael's coupon for $1. Where to put it? I stuck it in a "repurposed" butter dish (all I could find...I can't find a good apothecary jar in this town's thrift shops to save my life!). I'm still not sure how I feel about it. Since my gorgeous friend over at SouthernInspiration gave away a copy of Celebrate Spring, I looked all over town for a copy. I finally found some at Costco, deeply discounted, no less! I decided on Margaret's Black Walnut Pound Cake for a little girlie get-together I hosted last week. It is scrumptious! In a large bowl, beat butter and sugar at medium speed with an electric mixer until fluffy. Gradually add cake flour to butter mixture, alternately with cream, beginning and ending with flour, beating well after each addition. Add vanilla, stirring well to combine. Stir in walnuts. Pour batter into prepared pan, and bake for 2 hours, or until a wooden toothpick inserted in the center comes out clean. Let cake cool in pan for 10 minutes. Remove cake from pan and cool completely on a wire rack. Garnish with whipped cream. It's like buttah! No really, there's a lot of butter in there! No, my cake is not sprouting Gerber Daisies...I just took the photo from a different angle and liked it! Hey there! I just found your blog, it's great! I absolutely love that little nest you found and it looks perfect in that little butter dish! That's one cute baby in that frame! By the way, I LOVE the Dollar Tree! Hi, Amanda, thanks for stopping by! It's nice to meet you if I haven't been by your blog before, which I don't think I have. Very cute things for your kids! I'm sure they will love it all. On the spray paint for furniture, it's very easy. I just sprayed over that old color lightly, you want to keep the drips to a minimum. It dries very fast, so you can go back within a few minutes and spray some more. I just kept spraying, touching up all the spots until the whole can was gone. It covered completely! Very cute! I wish I had follow through...sadly follow through is not a trait of ADD, lol! I LOVE that nest, it's adorable! I love the way you put the nest next to your lovely daughter's baby picture. Looks like it's saying "the new beginning". We have a lady in our hometown named Phyllis Hoffman...wonder if it's the same (ha,ha). I love the birds nest in the butter dish. Actually, I would love the butter dish with or without the nest, it's gorgeous! I LOVE the nest in the butter dish. It really looks adorable. Cute easter gifts too. That's so sweet of you to think of her teachers! I love your new nest and it looks perfect in the butter dish. Why does my Michaels not have cute things like that?? 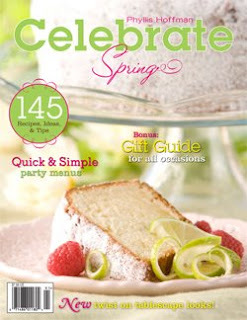 I am very jealous that you got a copy of Celebrate Spring. I saw it in Sam's a while back and was too cheap to buy it. We don't have Costco here. Maybe I should look at my Sam's again to see if any are left! Your cake looks oh so yummy!! oh manda, you should not have posted the recipe for that devil pound cake!!! man, that thing was so good! !